Winning Colors is the last of three fillies to win the Kentucky Derby. This we all who follow thoroughbred racing know. She won the race in 1988 beating a stellar field which included Forty Niner and Risen Star, the latter became winner of the other two Triple Crown races that year. Now even though Winning Colors was registered as a roan, she was actually a grey. Her winning colours of yellow and blue belonged to the late Eugene Klein, who had purchased her from her breeder Echo Valley Farm for $575.000 at the Keeneland July Select Yearling sales. She would go on to win $1,526,837 in her racing career and was subsequently purchased as a broodmare prospect by Gainesway Bloodstock for $4.1 million. Her pedigree shows a good blend of American and European breeding as she is by Caro, a 16.3 hand stallion imported to Spendthrift Farm from France. Caro became a very successful sire as he not only got Winning Colors but also champions With Approval and Cozzene, and major stakes winners or stakes sires such as Siberian Express, Dr. Carter, Tejano, Nebos and Crystal Palace, among his 13% stakes winners from named foals. Caro passed on his size, speed and colour to his champion daughter Winning Colors. Caro is a tail male descendant of Nasrullah through Grey Sovereign and his son Fortino II. His dam sire is champion English stayer Chamossaire, a son of champion Precipitation by Hurry On. All Rainbows is the dam of Winning Colors. She is a stakes winning daughter of Bold Hour who in turn is by Bold Ruler, a son of Nasrullah. This breeding means Winning Colors was inbred to Nasrullah 4×4 with a third cross to Nasrullah in her fifth generation through the dam sire of her dam T.V. Lark, a grandson of Nasrullah. The second dam of Winning Colors, Miss Carmie, is the dam of champion Chris Evert, so there is a good wealth of back class within the pedigree of Winning Colors. Winning Colors was 16.2 hands at full growth. She had a broad chest with a big rear engine and was larger than most colts of her generation. She had a speed style of running on the lead when she went racing and could relax well enough to carry her speed to longer distances. 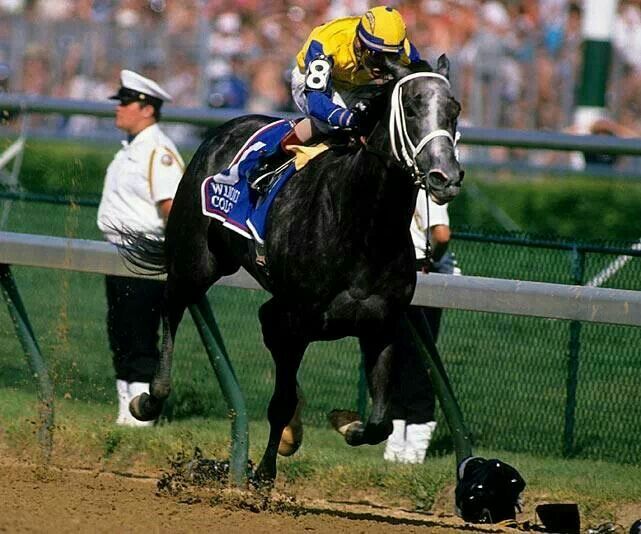 This she demonstrated to a national audience on Saturday May 7, 1988 when she led throughout to win the Kentucky Derby. The time for the race was a good 202:1/5 as she held off the late charge of Forty Niner and Risen Star to prevail. Winning Colors had come into the race with a growing reputation as she had already won the Santa Anita Oaks, defeating Goodbye Halo, and the boys in the Santa Anita Derby, including the notable Lively One. She had begun her career the year before in a maiden allowance event at Saratoga on August 13, 1987, winning the seven furlong race. Among the fillies Winning Colors beat that day was Epitome, who would go on to win the Breeder’s Cup Juvenile Fillies race later that season. Next time out for Winning Colors did not come until December 27, 1987 at Santa Anita winning a six furlong allowance. Three weeks later she made her three year old debut in the one mile La Centinela Stakes at Santa Anita, running her winning streak to three. She tasted defeat for the first time a month later in the Las Virgenes Stakes, finishing second to Goodbye Halo. It seemed as if Winning Colors was none too pleased with being headed in the Las Virgenes as she became unruly afterwards. Her victories in the two big grade one three year old races at Santa Anita confirmed this when she avenged her loss to Goodbye Halo in the Oaks and then beat the boys in the Derby, doing so with a front running style. Her popular win in the Kentucky Derby, also with the same catch me if you can manner, was guided by the very capable and astute judge of pace jockey Gary Stevens. Winning Colors could be quite a handful as she was very headstrong in her ways and needed a firm by understanding hand to get her to relax on the lead and save energy for the stretch run. Stevens was the perfect complement to Winning Colors’ running style. She would finish third in the Preakness to Risen Star and Brian’s Time and then wound up sixth in the Belmont Stakes, showing her distance limitations. Given a three months rest until her next race in September, Winning Colors finished second to Personal Ensign in the grade one Maskette Stakes at Belmont. She then ran an uninspiring fourth in the Spinster Stakes at Keeneland, before her rematch with Personal Ensign in the Breeder’s Cup Distaff, due to be run at Churchill Downs three weeks later. Personal Ensign was on a personal mission to finish her career undefeated and thus go into the history books as one of the greatest of all time. Winning Colors was perceived as the main threat to give the four year old Personal Ensign her first defeat. The race would become one of the classic races of the twentieth century. On a chilly, gloomy day weather-wise, Winning Colors came oh so close to defeating a legend, and in so doing claimed her spot as a legendary thoroughbred in the process. Very seldom does a horse attain such exulted praise in defeat as did Winning Colors on this day. The elements were against her as the track was a deep muddy surface from the rain of the previous day, which would make her front running style a little more difficult to sustain in such conditions. Personal Ensign was just able to get up to the wire to win by a scant nose, after Winning Colors had led though out and repelled the challenge of the very game Goodbye Halo, who finished a half length behind in third place. Winning Colors was named the Eclipse Award champion three year old filly after her stellar year of ten starts with four victories, three of which were in grade one races, two seconds and one third, her Kentucky Derby victory being the obvious highlight. Her four year old season was not as fruitful however with only two wins, the Turfway Breeder’s Cup Stakes and an allowance race, being her only wins from seven starts. With an overall record of nineteen starts, eight wins, three seconds and one third, Winning Colors was retired to become a broodmare. Klein sold her at the Keeneland November mixed sale to Gainesway Bloodstock before her first mating. However, Winning Colors did not become a stakes producing broodmare, much to the chagrin of her new connections and her fans. She had ten foals and was bred to such distinguished sires as Danzig, Mr. Prospector, Storm Cat, Rahy and Mr. Greeley. Unfortunately it was not to be for her offspring to become stakes winners. Winning Colors stayed at Gainesway for her entire after racing life. She became completely white, as all greys not roans do, by the time she was ten. She lived until the age of twenty-three when on February 17, 2008 she was humanely euthanized due the complications of severe colic. She is buried in a prominent place in the Greentree Cemetery, a part of the Gainesway property that had once been home for the famous Greentree Stud. In 2000 Winning Colors was elected in the U.S. National Museum of Racing Hall Of Fame. She will always be remembered for her gutsy front running victory in the Kentucky Derby, her loss by the narrowest of margins to a track legend and her powerful and very fluid running style. Winning Colors was very special indeed.